Have you ever wondered what life in the jungle would be like? If you’re like me, it could be your own personal paradise. The funny thing is, I never set out to live in the jungle. I’ve lived in several places, including Patagonia, Chile, where I worked for five months as an English teacher before I returned back “home” to Kentucky. But I missed Latin American culture, so I found a job as the marketing manager for Outward Bound Costa Rica, an adventure school based in the mountains of Tres Rios. The area, I discovered, was rustic—a small town about 25 minutes from the country’s capital of San Jose. What an experience. I would wake up to 360-degree jungle. A large river bordering one side was a short distance away , and yet in a very short amount of time I could be in the heart of San Jose’s city center, attending art shows or eating at a nice restaurant. My rent was free initially because it was part of my working deal, but my neighbors paid roughly $400 to $800 a month. In other jungle parts of Costa Rica, the same living situation, but much farther from the city, is extremely cheap: You’ll pay just $100 to $200 a month for a single-bedroom house. And there’s a jungle to suit every taste and climate preference. Want to be close to the beach, but still get a good breeze? Choose a jungle-lined loma or hill that will give you sweeping views and beach access. Want rural, cultural immersion? Head into the hills toward the coffee and cow farms to find an uncleared lot—you’ll have your own little forest and the bonus of some of the best, cheapest produce around. Or do like I did, and stay close to the city but far enough away to breathe deep the mountain air. The rule of thumb here is to head into the hills. Minutes from the bustling city centers, it’s easy to find single-family homes coexisting with massive palms, bamboo, tropical fruit trees, and songbirds galore. Living like the locals can be as enjoyable. And living more simply is good for your pocketbook, too. When I rented a house near the one I originally was in, I paid $400. It was in the same cool-climate area but with sweeping views of the city lights and surrounding mountains. Overall cost of living: $900 a month for my boyfriend and I. 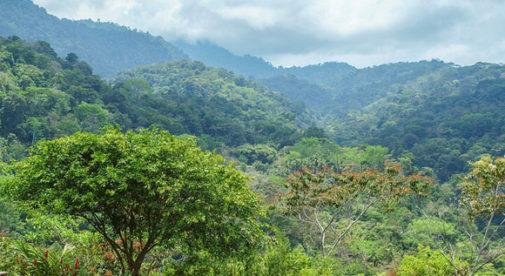 In Costa Rica you’ll find there is a jungle to suit all tastes and climate preference. You may even run into a few new friends. A huge benefit of living close to farms or fertile areas is a massive reduction in price for produce. We don’t shop at any big stores like Walmart or Automercado, and we take advantage of local events for entertainment. That $900 figure also includes trips to the beach at least once or twice a month. In Costa Rica, most beaches can be reached in an hour or so, no matter how inland you are. Practically, living in a jungle also helps tremendously to cut costs on air conditioning thanks to the cooling canopy of leaves overhead. 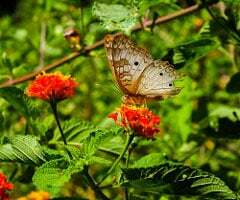 As for the bugs—they can be controlled, and there are also incredibly beautiful butterflies and birds that come with having insects around. In the jungle, you learn to adapt—suddenly getting your favorite shoes wet won’t be such a drama and shooing away a strange bug won’t be a big deal. By coping with the little things in the jungle, you’ll inevitably start to realize that it’s the big things that matter. Health won’t feel like a monthly membership—instead it will taste like the sweet flesh of a perfectly-plump papaya and smell like damp grass on an afternoon walk to town. Stress won’t seem to follow you as easily when bigger-than-life landscapes surround your daily activities, and appreciation will come naturally when the surprise of a brilliantly colored flower is enough to make your day. Living in the jungle isn’t for everyone, but that’s what makes it special. Costa Rica’s jungles could be your own personal paradise, too.